I have been lucky enough to meet some really great friends through my job. When I started at my company I was in meeting planning. All of the girls in my department became really close, probably because of all of the traveling we did together. There were meetings literally all over the world so we had a lot of bonding experiences while sitting at a hospitality desk outside of a meeting room. Sometimes that meeting room was in Singapore and sometimes that meeting room was at an airport hotel in Chicago, but I can tell you a hospitality desk and a banquet room is pretty standard no matter where you go! That original group of girls has scattered but we still remain good friends and try to get together on a regular basis to catch up. Sometimes we get together at a restaurant but more often we gather around someone’s kitchen table or island and chat over wine and appetizers. We start sending e-mails about a week before the event to decide who is bringing what. Everyone knows that Mary will bring dessert and that it will be fabulous. At our last get together she brought Paula Dean’s gooey butter cake. Oh my goodness gracious was that delicious. We are never short on dips and cheese but we are often lacking in protein. Please remember that this is a group of meeting planners so we strive to have a well balanced spread! For our most recent get together I took it upon myself to come up with the protein. I decided to make some Asian Turkey Meatballs. I didn’t have a recipe in mind but gathered up ingredients that I thought would be good together. I thought these little guys turned out great. I loved the Asian flavors of sesame oil, lime, ginger, and soy sauce. They were great as an appetizer/tapa but they would also be a great main course alongside some brown rice. I had some of the meat mixture left over after the party, so I sautéed it in a pan and added it to scrambled egg whites for a hearty breakfast the next day. So tasty! 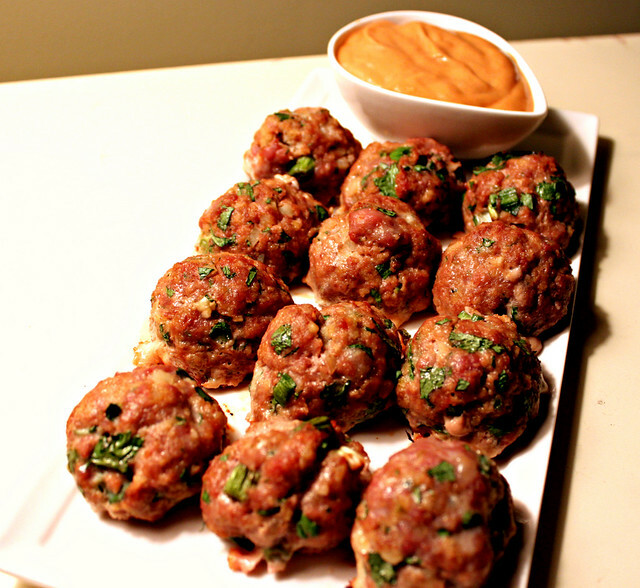 The Perfect Pairing for these Asian Turkey Meatballs is hoisin dipping sauce. I combined ½ cup of reduced fat mayo with 2 tablespoons of hoisin sauce, the juice of half of a lime, and a teaspoon of spicy sriracha sauce. Preheat oven to 500 degrees F. Cover 2 baking sheets with foil and spray with cooking spray. Combine all of the ingredients into a large bowl. Mix well with your hands until the ingredients are evenly distributed. Using about 3 tablespoons of the mixture, roll into balls. Place the meatballs on the greased cookie sheets until you have used all of the mixture. Bake until cooked through, approximately 15 minutes. Omg, have to try this! And the hoisin dipping sauce! Thank you!